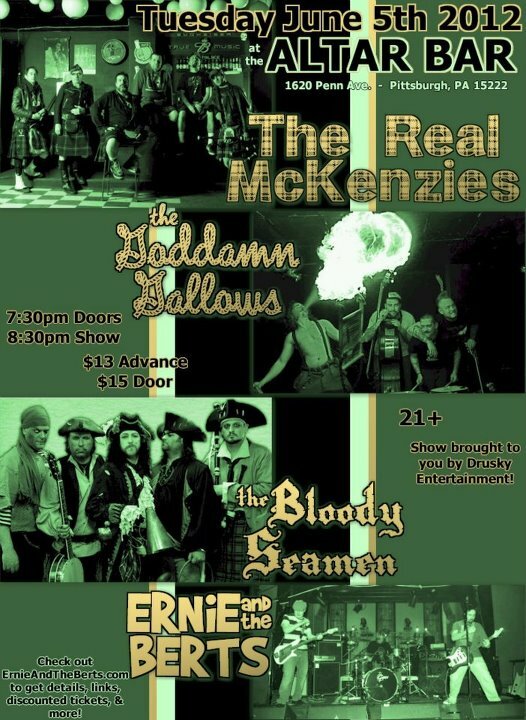 Vancouver BC’s The Real McKenzies coming to Pittsburgh tonight! Around for nearly two decades now, The Real McKenzies were one of the first to come up with the idea of blending old Scottish drinking song styles with punk rock music — incorporating bagpipes into all their songs (as well as appearing in traditional highland dress). You can read more about the band’s inception and their long history here; then head on out to the Altar Bar this evening for some great, rowdy fun! Shows in the middle of the week are always tough — I’m on my way to work right now and already feeling like I’m running out of gas; knowing I have to do this again tomorrow morning makes me especially unhappy. But they’ve really sweetened the pot with the rest of this line-up: you won’t want to miss this show! Taking the rockabilly/psychobilly concept to ridiculous new heights, The Goddamn Gallows have augmented the typical “punk band with an upright bass” arrangement by also adding mandolin, banjo, accordion, and washboard; this has prompted the band to describe themselves as old-timey “gutterbilly” punk. You can read up on their story here. And as an added bonus, there will be two a great local opening acts — pirate rockers extraordinaire The Bloody Seamen (recently profiled by Valley of Steel here) and sleazy muppet punks Ernie and the Berts (discussed in brief a few months ago, here)! Find all the details you’ll ever need here, including links to all the bands’ Facebook pages, information on buying tickets, and how you can win a pair of Ernie’s pants (there’s still time to get entered, but it’s running out quickly!) As an added bonus, there are additional Facebook events here, here, and here!